Purpose: The hydrophilicity of some elastomeric impression materials has not been fully established. The purpose of this study was to measure and compare the advancing contact angle of water on the surface of several set elastomeric impression materials. Materials and Methods: We tested various consistencies of vinyl polysiloxane (VPS; Imprint 4) and vinyl polyether silicone (VPES; EXA’lence) with a polyether (PE; Impregum Soft) control. Impression discs (25.07 mm) were made using a metal die and ring. Deionized ultra-filtered water was placed on each disc and contact-angle measurements were made at 0, 15, 30, 45 and 60 s using a video contact angle drop shape analysis machine. The data were analyzed using repeated ANOVA and a post-hoc test with Bonferroni correction. Results: VPS contact angles reached a mean of 10.1° ± 0.2° at 60 s vs. 40.7° ± 0.1° for VPES. Overall, VPS contact angles were smaller than those for VPES at all measured times. However, heavy and super quick heavy VPS had much higher contact angles at 0 s compared with other VPS consistencies. There was a significant difference in contact angles between VPS and VPES (mean difference 33.9°, p < 0.05) and between VPS and PE (mean difference 32.8°, p < 0.05) but not between VPES and PE (P = 0.196). VPS heavy and super quick heavy were significantly different from other VPS materials (p < 0.05), but not from each other (p = 1.00). Conclusions: Set VPS is more hydrophilic than VPES. Contact-angle values of VPS indicated super hydrophilicity. VPES was hydrophilic, with measurements similar to the PE control. Thus, VPS impression materials may be excellent in terms of spreading and copying wet surfaces. Vinyl polysiloxane (VPS) and polyether (PE) impression materials are widely used in restorative dentistry. Although VPS is generally considered hydrophobic,1,2 polyether is a hydrophilic material that can help produce accurate and void-free impressions and casts.3 The hydrophilicity of an impression material can be assessed by carrying out a wettability test, for example by measuring the advancing contact angle of water on its surface.4,5 The lower the contact angle the more hydrophilic the impression material. GC America (Alsip, Ill.) claims that EXA’lence, a vinyl polyether silicone (VPES) impression material, is intrinsically hydrophilic because of its polyether content. Imprint 4 (3M ESPE, St. Paul, Minn.) is a VPS introduced as a new hydrophilic addition silicone impression material. These materials are produced in several consistencies for use in restorative treatment (Table 1). Table 1: Impression materials tested for hydrophilicity. 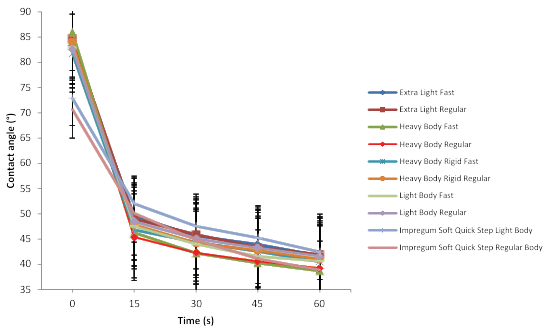 A study27 comparing the contact angles of water and saliva on unset light-body Imprint 4 (VPS) and unset extra-light-body EXA’lence (VPES) showed that the modified VPS had a water contact angle < 20° whereas the hybrid VPES angles were higher, around 35°. No studies on the wettability of other consistencies or on set Imprint 4 or EXA’lence have been reported. Therefore, this investigation aimed at studying the wettability of set Imprint 4 and EXA’lence impression materials by comparing their advancing contact angles using a PE, Impregum Soft (3M ESPE) control. As both materials are claimed to be hydrophilic, the null hypothesis was that there would be no significant difference in water contact angle between set Imprint 4 and EXA’lence. 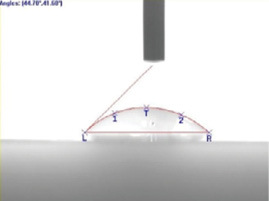 Advancing contact-angle measurements were made on the set surfaces of Imprint 4 and EXA’lence at 5 times over 1 minute. The materials used consisted of 2 Impregum Soft, 6 Imprint 4 and 8 EXA’lence products (Table 1). A stainless-steel die and ring (Sabri Dental Enterprises Inc., Downers Grove, Ill.) were used to make 5 discs of each material, resulting in a total of 80 discs.28 The round impression discs, which were 25.07 mm in diameter, were made according to manufacturer’s instructions at room temperature (23° ± 2°) and relative humidity 55 ± 5%, but were left for an extra 30 s beyond the recommended setting time before removing them from the ring. Each disc was tested with 5 separate droplets of deionized ultra-filtered water, with 2 contact-angle measurements made (right and left sides, Fig. 1) for each, at 0, 15, 30, 45 and 60 s, resulting in 50 measurements for each material tested per time point. Figure 1: Location of the 5 measurements made on each water droplet. The contact angle of water droplets was measured using a drop shape analysis (DSA) machine (VCA Optima, AST products, Inc. Billerica, Mass.). A disc was placed on the platform of the VCA Optima machine just below the needle, from which a 1-μL water droplet was dispensed from the 100-μL pipette and the contact angle was measured in degrees using the software included with the machine. A video recording was made showing water droplet activity on the disc surface, so that contact-angle measurements could be made at the specified time intervals. The recording was stopped every 15 s to make 2 measurements as described above. After 5 markers (L, R, 1, 2 and T) were manually placed around the droplet using the computer mouse, the manufacturer’s software automatically calculated the contact angles. The mean values for Imprint 4 measurements were lower than those of EXA’lence and Impregum at all measurement times (Figs. 2 and 3); they ranged from 41.2° ± 1.3° at 0 s to 10.1° ± 0.2° at 60 s, whereas EXA’lence values ranged from 83.7° ± 1.2° to 40.7° ± 0.1°. The angles for all Imprint 4 consistencies were between 13.8° ± 0.2° at 15 s and 10.1° ± 0.2° at 60 s. However, the initial values for heavy and super quick heavy formulations were higher (Fig. 4). The contact angles for these 2 materials were 80.89° and 78.5°, respectively, at 0 s but dropped sharply to below 20° at 15 s and continued to decrease slightly in a manner almost identical to the other Imprint 4 consistencies (Fig. 4). EXA’lence and Impregum both had high values at 0 s, averaging 83.7° ± 1.2° and 71.8° ± 2.3°, respectively. However, starting at 15 s, both materials had much lower contact angles that were similar to each other, reaching approximately 40° at 60 s (Figs. 3 and 5). 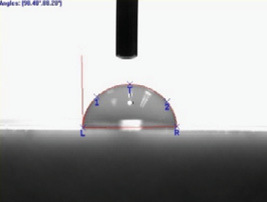 Figure 2: Average contact angle of water on the surface of set impression material discs: polyether (PE), vinyl polysiloxane (VPS) and vinyl polyether silicone (VPES). For each disc, 5 water droplets were measured on 2 sides at 15-s intervals from 0 to 60 s. Box plots depict minimum, maximum and percentiles; circles indicate potential outliers. 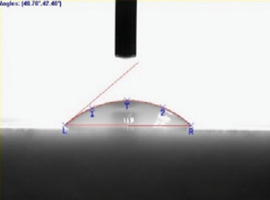 Figure 3: Overall contact angles of water on tested surfaces of vinyl polyether silicone (VPES, EXA’lence), vinyl polysiloxane (VPS, Imprint 4) and polyether (Impregum Soft, control) at 5 measurement times. The vertical lines indicate standard error. Point measurements are connected by lines to aid visualization of trends. Figure 4: Contact angles of water on the set surface of various formulations of vinyl polysiloxane (Imprint 4, solid lines) and the control, polyether (Impregum Soft, dotted lines) at 5 measurement times. The vertical lines indicate standard error. Point measurements are connected by lines to aid visualization of trends. 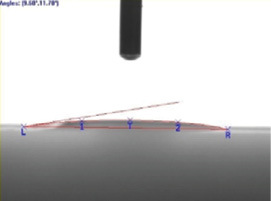 Figure 5: Contact angles of water on the set surface of various formulations of vinyl polyether silicone (EXA’lence) and the control, polyether (Impregum Soft, dotted lines) at 5 measurement times. The vertical lines indicate standard error. Point measurements are connected by lines to aid visualization of trends. Figure 6: Representative images of water droplets on 3 set impression materials at 5 measurement times: polyether (PE, Impregum Soft, light body, quick step), vinyl polysiloxane (VPS, Imprint 4, light body, regular set) and vinyl polyether silicone (VPES, EXA’lence, light body, regular set). Repeated measures ANOVA was carried out to compare average contact angles of the materials over time and a post-hoc test with Bonferroni correction was applied. As Table 2 shows, there was a significant difference in contact angles between Imprint 4 and EXA’lence (mean difference 33.9°, p < 0.05) and between Imprint 4 and Impregum measurements (mean difference 32.8°, p < 0.05). However, there was no significant difference between EXA’lence and Impregum overall during the 60 s (p = 0.196). The mean differences between most tested consistencies and test times were small, ranging from 0.7° to 2.9°, except for Imprint 4 heavy and super quick heavy. Contact angles for these consistencies were significantly different from all other Imprint 4 materials (p < 0.05), but similar to each other (p = 1.00). Overall mean differences of heavy and super quick heavy consistencies ranged from 11.2° to 12.6° compared with regular and light Imprint 4, and from 50.4° to 58.7° (p < 0.05) compared with all Imprint 4 consistencies at time 0 s (Figs. 2 and 4). 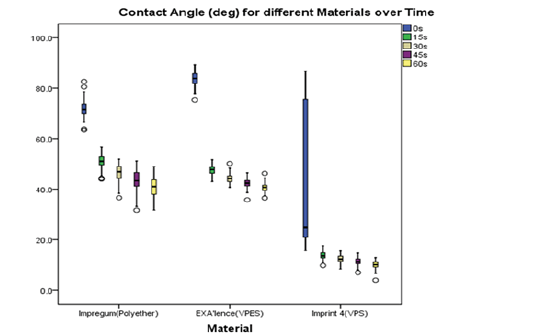 Table 2: Pairwise comparison of the contact angle of water on 3 impression materials: Impregum Soft (PE), Imprint 4 (VPS), and EXA’lence (VPES), at all test times (0–60 s). Note: CI = confidence interval, SE = standard error. *PE = polyether, VPS = vinyl polysiloxane, VPES = vinyl polyether silicone. †p values are based on Bonferroni correction. Figure 6 shows representative images of water droplets on a disc surface at the 5 measurement times for Impregum Soft light, quick step, EXA’lence light, regular set and Imprint 4 light, regular set. The null hypothesis, that there would be no significant differences between the water contact angles of Imprint 4 and EXA’lence was rejected, as Imprint 4 had much lower contact angle values. In general, elastomeric impression materials have contact angles around or greater than 45°. An early study13 reported values of 53° for a surfactant-modified (hydrophilic) VPS, 49° for a PE, and 98° for the regular VPS tested. Unlike PE which has affinity for water, VPS can be improved in terms of wettability by incorporating non-ionic surfactants. The surfactant molecules diffuse from VPS into the aqueous phase in contact with it, increasing wettability and lowering the surface tension.6 Another early study14 showed a range of contact angles for water on silicone surfaces from 38° to 108° depending on surfactant type and concentration (not all surfactants led to a decreased contact angle). Such variations in contact angle are seen in other studies too. Vassilakos and Fernandes15 reported a range of 50°–86° for VPS contact angles on specimens exposed to saliva vs. 30°–45° for PE; these contact angles are close to the 60°–84° range for VPS and 35° for PE report, which also showed a correlation between wettability and the number of voids in stone models.3 These findings indicate that surfactants play an important role both before and after the setting of VPS. Furthermore, surfactants incorporated into impression materials leach out into liquid in contact, hence reducing the liquid’s surface tension and allowing it to spread over the material surface.23 Kanehira et al.8 also stated that hydrophilic VPS probably has a continuous supply of surfactant that diffuses to the surface leading to a step-wise reduction in contact angles. This explanation was made as repeated rinsing of surfactant, containing VPS produced higher contact angles that settled at 85°. 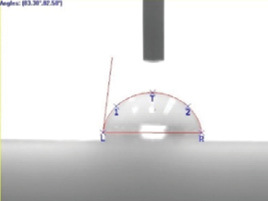 Lee et al.24 studied the effect of incorporating different surfactants in impression materials and found that contact angles decreased as the concentration of a non-ionic surfactant increased. The contact angle ranged from 84° with 0.5% surfactant to 33° with 2.5% surfactant, compared with 105° without surfactant. In comparison, the results of our study show that, regardless of the initial measurement (at 0 s), Imprint 4 contact angles averaged around 10° at 60 s, indicating super-hydrophilicity. The high initial values for the two heavy-body materials (around 80°) might be a result of the high percentage of filler, compared with lighter consistencies, which might keep the surfactant from reaching the surface quickly, as those high initial measurements dropped sharply after 15 s (Fig. 4). EXA’lence, on the other hand, was similar to PE in terms of wetting behaviour (Fig. 5), as average angle measurements dropped within the first 15 s from above 80° to a range of 40°–43°. This average is comparable to other reports on PE indicating that the PE component of EXA’lence may have affected the outer surface of the material leading to behaviour similar to that of PE alone. Although several reports have shown variable contact angles with surfactants from 60°–90°,17-19, 21 the current investigation showed the contact angles of Imprint 4 from 17°–36° at 0 s to 7°–12° at 60 s for light and regular consistencies. For materials studied during setting, the faster kinetics toward hydrophilicity led to high-quality impression results, which could be partly the result of intrinsic surfactants.4 Menees et al.27 hypothesized that the inherent chemical composition of the hydrophilic PE and hydrophobic VPS could also explain the behaviour of these materials. Imprint 4 contains a modified polyalkylene oxide surfactant with hydrophilic and hydrophobic regions. However, for hybrid materials, EXA’lence (with no surfactant) had high contact angles using water and saliva but Identium (with a surfactant) had the lowest angles, probably because of its surfactant content and grafted polyether groups. The setting time of impression materials is recommended by the manufacturer based on clinical use. As temperature may affect setting properties, in vitro tests at room temperature may differ from the clinical setting.29 An extra 30 s beyond the manufacturer’s recommended setting time was added in our experiments and was consistent for all materials. Compared with Impregum Soft and EXA’lence, Imprint 4 showed super hydrophilicity based on contact angles on set impression materials. After the initial 15 s of testing, contact angles for EXA’lence were similar to those for Impregum Soft. Dr. Nassar is associate professor, faculty of medicine and dentistry, Division of Restorative Dentistry, University of Alberta, Edmonton, Alberta. 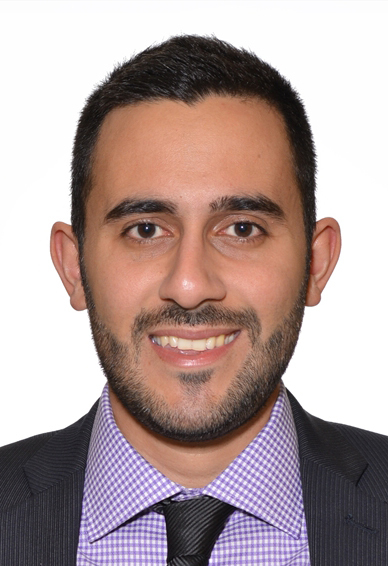 Dr. Tavoossi is a GPR resident, UCLA, Los Angeles, California. Ms. Yan Wen Pan is an undergraduate student, faculty of science, University of Alberta, Edmonton, Alberta. Mr. Milavong-Viravongsa is an undergraduate student, faculty of science, University of Alberta, Edmonton, Alberta. Dr. Nychkais a professor, chemical and materials engineering, University of Alberta, and an adjunct associate professor, faculty of medicine and dentistry, school of dentistry, University of Alberta, Edmonton, Alberta. Acknowledgement: This study was supported by University of Alberta Fund for Dentistry grant DEN 18. Correspondence to: Dr. Usama Nassar, 5-527 Edmonton Clinic Health Academy, University of Alberta, Edmonton AB T6G 1C9. Email: unassar@ualberta.ca. Hamalian TA, Nasr E, Chidiac JJ. Impression materials in fixed prosthodontics: influence of choice on clinical procedure. J Prosthodont. 2011;20(2):153-60. Mandikos MN. Polyvinyl siloxane impression materials: an update on clinical use. Aust Dent J. 1998;43(6):428-34. Michalakis KX, Bakopoulou A, Hirayama H, Garefis DP, Garefis PD. Pre- and post-set hydrophilicity of elastomeric impression materials. J Prosthodont. 2007;16(4):238-48. Rupp F, Axmann D, Jacobi A, Groten M, Geis-Gerstorfer J. Hydrophilicity of elastomeric non-aqueous impression materials during setting. Dent Mater. 2005;21(2):94-102. Woodward RP. Contact angle measurements using the drop shape method. Portsmouth, Va.: First Ten Angstroms; n.d. Accessed 2017 March 27. Available from: http://www.firsttenangstroms.com/pdfdocs/CAPaper.pdf. Powers JM. Replicating materials — impression and casting. In: Sakaguchi RL and Powers JM, editors. Craig’s restorative dental materials. 13th ed. Philadelphia: Elsevier Mosby; 2012:296-8. Craig RG, Sun Z. Trends in elastomeric impression materials. Oper Dent. 1994;19(4):138-45. Kanehira M, Finger WJ, Komatsu M. Surface detail reproduction with new elastomeric dental impression materials. Quintessence Int. 2007;38(6):479-88. Millar BJ, Dunne SM, Robinson PB. An in vivo study of a clinical surfactant used with poly(vinyl siloxane) impression materials. Quintessence Int. 1996;27(10):707-9. Millar BJ, Dunne SM, Robinson PB. The effect of a surface wetting agent on void formation in impressions. J Prosthet Dent. 1997;77(1):54-6. Blatz MB, Sadan A, Burgess JO, Mercante D, Hoist S. Selected characteristics of a new polyvinyl siloxane impression material — a randomized clinical trial. Quintessence Int. 2005;36(2):97-104. Panichuttra R, Jones RM, Goodacre C, Munoz CA, Moore BK. Hydrophilic poly(vinyl siloxane) impression materials: dimensional accuracy, wettability, and effect on gypsum hardness. Int J Prosthodont. 1991;4(3):240-8. Pratten DH, Craig RG. Wettability of a hydrophilic addition silicone impression material. J Prosthet Dent. 1989;61(2):197-202. Norling BK, Reisbick MH. The effect of nonionic surfactants on bubble entrapment in elastomeric impression materials. J Prosthet Dent. 1979;42(3):342-7. Vassilakos N, Fernandes CP. Surface properties of elastomeric impression materials. J Dent. 1993;21(5):297-301. Dvis BA, Powers JM. 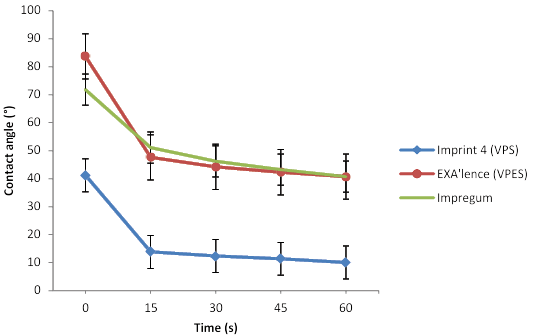 Effect of immersion disinfection on properties of impression materials. J Prosthodont. 1994;3(1):31-4. Kess RS, Combe EC, Sparks BS. Effect of surface treatments on the wettability of vinyl polysiloxane impression materials. J Prosthet Dent. 2000;84(1):98-102. Milward PJ, Waters MG. The effect of disinfection and a wetting agent on the wettability of addition-polymerized silicone impression materials. J Prosthet Dent. 2001;86(2):165-7. Lepe X, Johnson GH, Berg JC, Aw TC, Stroh GS. Wettability, imbibition, and mass change of disinfected low-viscosity impression materials. J Prosthet Dent. 2002;88(3):268-76. Blalock JS, Cooper JR, Rueggeberg FA. The effect of chlorine-based disinfectant on wettability of a vinyl polysiloxane impression material. J Prosthet Dent. 2010;104(5):333-41. Lad PP, Gurjar M, Gunda S, Gurjar V, Rao NK. The effect of disinfectants and a surface wetting agent on the wettability of elastomeric impression materials: an in vitro study. J Int Oral Health. 2015;7(6):80-3. Kang YS, Rueggeberg F, Ramos V Jr. Effects of chlorine-based and quaternary ammonium-based disinfectants on the wettability of a polyvinyl siloxane impression material. J Prosthet Dent. 2017;117(2):266-70. Balkenhol M, Haunschild S, Lochnit G, Wöstmann B. Surfactant release from hydrophilized vinylpolysiloxanes. J Dent Res. 2009;88(7):668-72. Lee DY, Oh YI, Chung KH, Kim KM, Kim KN. Mechanism study on surface activation of surfactant-modified polyvinyl siloxane impression materials. J Applied Polymer Sci. 2004;92(4):2395-401. McCormick JT, Antony SJ, Dial ML, Duncanson MG Jr., Shillingburg HT Jr. Wettability of elastomeric impression materials: effect of selected surfactants. Int J Prosthodont. 1989;2(5):413-20. 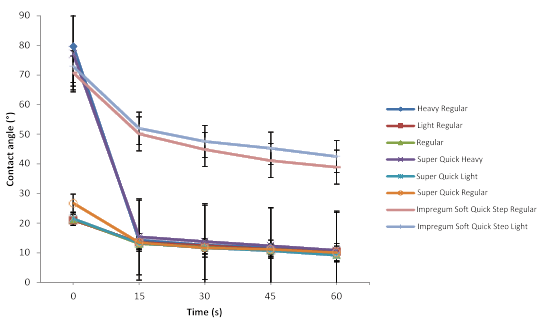 Erkut S, Can G. Effects of glow-discharge and surfactant treatments on the wettability of vinyl polysiloxane impression materials. J Prosthet Dent. 2005;93(4):356-63. Menees TS, Radhakrishnan, R, Ramp LC, Burgess JO, Lawson NC. Contact angle of unset elastomeric impression materials. J Prosthet Dent. 2015;114(4):536-42. Nassar U, Chow AK. Surface detail reproduction and effect of disinfectant and long-term storage on the dimensional stability of a novel vinyl polyether silicone impression material. J Prosthodont. 2015;24(6):494-8. Berg JC, Johnson GH, Lepe X, Adán-Plaza S. Temperature effects on the rheological properties of current polyether and polysiloxane impression materials during setting. J Prosthet Dent. 2003;90(2):150-61.